Ulster's postponed Pro12 game against Newport Gwent Dragons has been rearranged for Friday, 5 February. The game had to be moved from the weekend of 8-10 January to allow Ulster to play their postponed European Champions Cup game against Oyonnax. The Pro12 game will have a 19:35 GMT start at Kingspan Stadium. Munster's game against Zebre has been rescheduled for Saturday, 30 January while Ulster face Benetton Treviso in Italy on the same day. 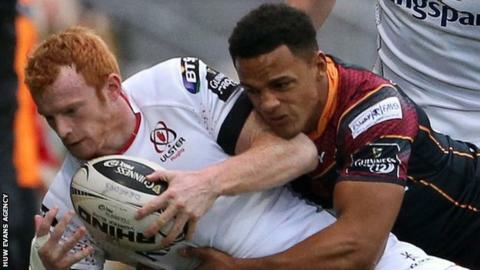 Ulster defeated the Dragons 19-12 in Wales on 8 November.